Access California Services (AccessCal) is an officially certified Covered California (ObamaCare) education and enrollment entity. AccessCal helps members of our community become aware of the intricacies of the Affordable Care Act, and promotes an understanding of the eligibility requirements to get covered. 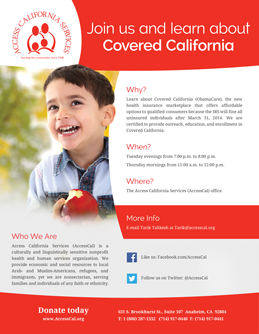 AccessCal can help you enroll in a suitable Covered California or MediCal plan. The Affordable Care Act requires most people to have public or private health insurance by February 15, 2015 or face financial penalties by the IRS. The less income you earn, the more financial assistance you can receive. You may even qualify for free health insurance through Medi-Cal. For enrollment assistance or for more information, contact us at (714) 917-0440.